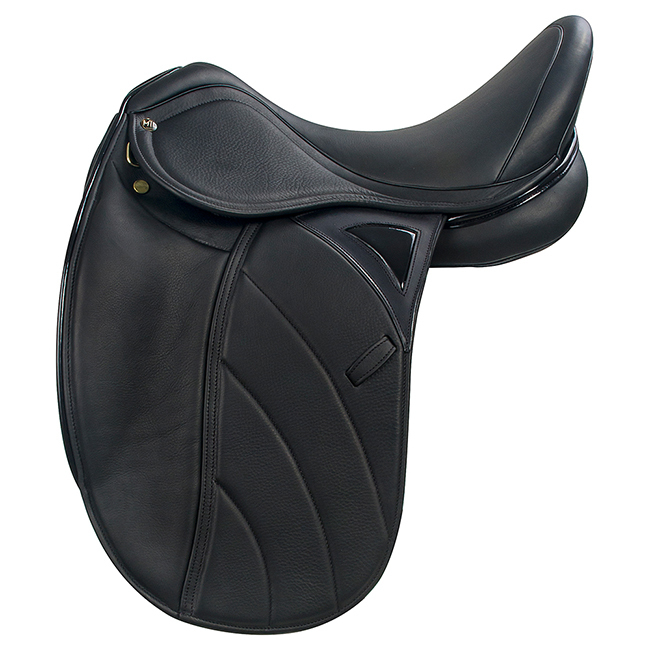 Select Size 16 1/2" 17" 17 1/2" 18" 18 1/2"
The NEW M. Toulouse Performance double leather Dressage saddle has a medium-large knee block and a soft padded flap that molds perfectly over the block. The front billet runs behind the sweat-flap, reappearing on top through a slot for stability. The rear V-Billeting system equalizes the back billet position. Accented and trimmed with patent leather for a little pizazz in the show-ring. Soft padded double leather needs no breaking in, with just the right amount of grip. Wool STP Advantage panels and Genesis Adjustable Tree for a custom fit. Black Sizes 16 1/2” - 18 1/2” Genesis Adjustable Tree only.